Please welcome Diana Pharaoh Francis to The Qwillery. Trace of Magic, the first novel in the Diamond City Magic series, was published on August 29, 2014. Hello everyone and thanks to Sally for inviting me to play in the sandbox! First, I want to offer a small hosannah and hallelujah for the fact that my kids started back to school today. I love my children, but oh, I need some time to work without interruption. I’m betting a few of you are dancing around happy, yourselves. The reason Sally invited me here today is because I have a new book out titled Trace of Magic. It’s a noir/urban fantasy/mystery/romance set in Colorado. It involves a magical mafia, diamonds, a kidnapping, and a corrupt cop. My main character is Riley Hollis. She’s a tracer. Everybody leads behind a trail, like a ribbon of light, called trace. Some people can see it, and they are called tracers. The thing about Riley is that she’s a super powerful tracer. She can track dead people, which is pretty much impossible. She can do a few other things too, but the problem is, she can’t let too many people know, or she’s likely to end up killed or captured by a mob group. So she spends a lot of time keeping her head down and avoiding notice. There are five major kinds of talents in Diamond City, where the novel is set—tracers, travelers, dreamers, makers, and binders. Then there are a whole lot of more minor powers, some more useful than others. There are haunters—they have to touch you, but then they can get inside your mind and mess with your perceptions and create nightmares that you can’t escape. But they have to be touching a person the entire time. There are also tinkers, who can essentially move things telepathically. They are frequently doctors or medical personnel, but some are good with flesh, others limited to metals, others who can only work with plastic. It’s pretty arbitrary who gets what, and how much they might do with it. There are hundreds of minor and odd sorts of little talents, and then varying levels of power. What tremendously fun about writing in this world is that even when you’re stupid powerful, your talent can only get you so far. Sure, Riley can find people, but once she does, she could be in serious trouble. It’s not like she can throw fireballs or paralyze people or throw them across the room. She has to use her brains and sometimes she gets into a fair bit of trouble. She’s caught between this place where she feels the need to hide from getting noticed (her mother was murdered and her father vanished, so she has reason to fear the mob) and yet she wants to use her talent for good. And then . . . doing good gets her noticed by the wrong guy. Everything goes haywire from there. It’s a really fun story—fun to write and I hope fun to read. Now let me ask you—if you could have a magic talent to help in your daily life, what would it be? Oh, and buy the book! I’d appreciate reviews as well, and word of mouth. Even the most powerful tracers can't track you if the magical trace you leave behind is too old. But I can track almost anything, even dead trace. That makes me a unicorn, the Tooth Fairy, the Easter Bunny, and the Lock Ness Monster all rolled into one. In a word, I am unique. A very special snowflake. And if anyone ever finds out, I'll be dead or a slave to one of the Tyet criminal factions. Riley Hollis has quietly traced kidnapped children and quietly tipped the cops to their whereabouts one too many times. Now she's on the radar of Detective Clay Price, a cop in the pocket of a powerful magic Tyet faction. When he blackmails her into doing a dangerous trace for him, Riley will have to break every rule that keeps her safe. Or become a Tyet pawn in a deadly, magical war. Trace of Magic features exceptional worldbuilding, an interesting magic system and terrific characters. Francis does a wonderful job showing the relationships between the characters - whether it's Riley Hollis and her sister Taylor, Riley and her friend Patti, or Riley and Detective Clay Price. I especially love the verbal interactions between Riley and Clay. Their banter often brought a smile to my face. Riley is the pivotal character in the novel and tells the story. The events swirl around her, usually/mostly out of her control. She's tough and does not give up even when it comes at personal cost to her. I enjoyed watching her journey during the novel. She's often conflicted, makes mistakes and treads where she should not. Riley makes some difficult decisions and by the end of the novel we, like Riley, have a much clearer sense of what she wants to do and be going forward. Detective Clay Price is a great foil for Riley and an engaging (and well-developed) character. He also has changes in store for him over the course of the novel some clearly not as welcome as others. The worldbuilding is really well done. The magic system is both different and interesting. The story has dark touches of noir swirling around like the snow falling on Diamond City. I got a clear geographical sense of Diamond City, which is fascinating in its own right. The pacing of Trace of Magic could not be better. There is plenty of action, bad guys, and many in the grey area of are they good or bad or both? There is a romance in the novel as well, but all that I am going to say about it is that it's very well done. Trace of Magic, however, is not primarily a romance novel, though I enjoyed that part of the novel a lot. 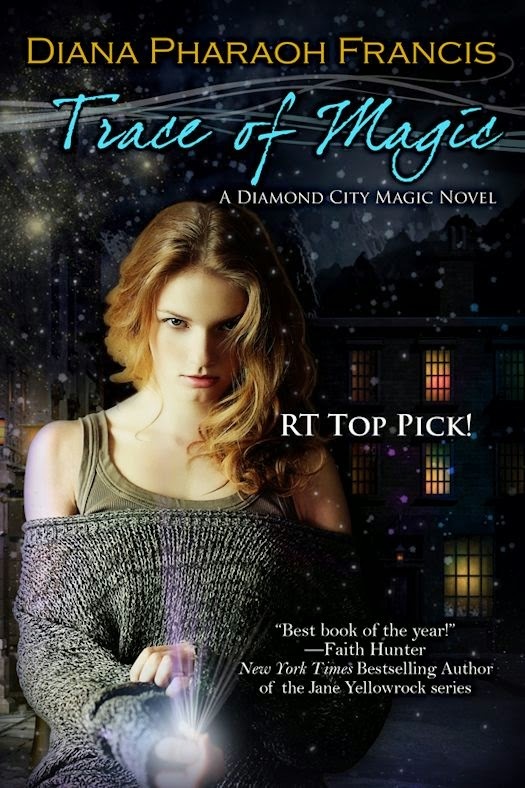 Bottom Line: Trace of Magic is a wonderful start to the Diamond City Magic series and Riley Hollis is one of new favorite Urban Fantasy heroines. I didn’t start out to be a writer. I was a storyteller from as far back as I can remember, and a daydreamer of epic stories, but it never occurred to me to write anything down. I read voraciously, but I wasn’t one of those people who said–hey! I could do this! Or even, this is so awful I could do better. 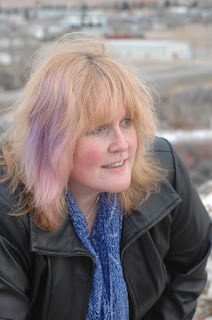 I marveled at writers and thought of writing as something other people did. I did try my hand at some really horrible poetry in my senior year of high school. It was dramatic and bleak and world-tiltingly awful. When I got to college, I did poorly in my freshman comp class. I wrote in purple prose and use twenty words for what I could say in two. I loved language, but I didn’t really have much control over it. Then I took a creative writing class. It was awful. Total slaughter. I had caught the bug, though, and from there on out, I wrote. Eventually I wrote a really bad romance and finished it. I finished it! I could do that! And then I went to graduate school and another graduate school, got married, had dogs, had kids, went to work professing, and kept writing. Finally I had my first book accepted and I’ve been writing ever since. As far as the prosaic stuff goes, I like to crochet, bake bread, spoil corgis, eat chocolate, sing to the radio, pretend to play tennis, geocache, crochet, and garden. Though I really hate weeding. I also like to make my hair purple with some frequency. You can find me on Twitter as @dianapfrancis and my website at www.dianapfrancis.com or on Facebook.